SIR I I AM NEW IN PLC PROGRAMMING PL ADVIVE ME HOW CAN RESET DATA REGISTER IN FLOTING MODE ON DELTA PLC. . I have a problem with simulation. During Simulation, the CPU stops without any error, warning, or message. if you are use updated WPLSOFT then use 1 step lower version of it.. else update it whit new one if available. SIR I LOST DEVICE COMMENTS WHILE DOWN LOAD FROM PLC TO PC. HOW CAN I DOWNLOAD THE DEVICE COMMENT TOO. you cant….. PLC do not store comments……………. You can if you uploaded the comments to the plc. I get an error message “could not create some temporary files” whenever I compile a ladder program. I found many people struggling with this same problem. I am using a delta wplsoft simulator and getting an error. complier cannot create some temporary files . can somebody help to resolve it. Power Analyser Model PAC-96 Inter showing negative value of Energy in KWH on HMI through Delta DVP 16 ES2. What is the problem kindly any one help? WonderLogix is a partner company of ours that offers programming PLCs in plain English (No Coding Required) and it will be my pleasure to introduce you to them. Hello Every one, Thanks in Advance, i had been working with simatic manager, tia portal and Somachine,gx works fatek but now iam a new person to the delta plc recently i noted that 3 no’s of plc cpu mounted in a single rail,is it possible to configure a sigle program? Or else we have to use another language otherthan ladder? I NEED TO COMMUNICATE PLC WITH DOPB07E411 HMI THROUGH ETHERNET AND 4 OTHER DIGITAL CLOCK DISPLAY WHICH IS RS-485 MODBUS SUPPORTED. SO CAN I COMMUNICATE THESE ALL AT SAME TIME? I am using Delta DVP14SS2. I am using an HSC on X0. The present value is available from C235. I want to move the C235 value to another register example D200 or such. But I am not able to move the value. Gives invalid command. I tried FMOVE and also tried moving to E and F registers. I want to send an email from Delta Plc to my e mail box.How can i do this? anyone can help me? you have to use plc or control which support that feature. like GSM module than only you can make it happen. pls provide the plc model. lets see if it will support SMTP protocol or not. I am having trouble setting up a network module the as00scm-a as a remote module with the as332p, i have followed instructions from the manual. can anyone give me tips on how to set the two up. What is the meaning of this warning ? How to check the particular step in Object Code ? how to increase input outputs using extension in software.it means how to set input output extension in dvp software. not required to set it jst you its address …. e.g. y20, y21 and so on…. What is the Delta DVP-14SS PLC “Run” command code? i’m new with delta programiing. i tried to install (analog module 04ad-e2) to my delta plc32 es2, once i click the bottum appears this message ( this models does not support this funktion!!!) plz help. DVP-14SS outputs stopped suddenly “RUN” LED off. What could be the problem? please check the data sequence before making connection..
Can we display data in data register on LCD display? I would like to read data from a couple of devices communicating as Modbus TCP Slaves. Will ETHRW instruction work on DVP12SE11 PLC? i have dvp28sv model plc. it generates “memory capacity does not correspond with model type!” while write to plc. please share your toughts to solve the issue. I have got the same problem “memory capacity does not correspond with model type” with Model DVP-14SS2. Please I need help? Estimados, yo tenia el mismo problema. El error era que el tipo de PLC no correspondió. Yo tenia SS y debía ser SS2. DVP28sv and DVP28sv2 please check the difference between both… while selecting plc in software check for it…. old one is 28sv and new one is 28sv2… s8sv2… here 2 is not mentioned on physical plc device. Does Delta PLC support IO- link sensors and modules? I have 20sx2 PLC.. I need help for this one. Not equal comparison that time one output get ON then I will change one register value that is also not equal and this time also same output get OFF 1sec and ON continuously when change the register value again simultaneously. It is possible please give me support to solve this one. You can use LD for not equal comparison. i have a delta plc DVP 12SA at working condition for my machine. i bought a new PLC model DVP 12SA2 for a spare option. i was trying to get programme from the old one was required password. unfortunately the real programmer is not available. if the plc have password in it. no one going to help you . you need a proper password else write new program.. writing new one is more easy than finding password. Respected sir.. As im using delta DVP10X plc and delta VFD E-series. and looking for getting run feedback from vfd. so, could u help me for the same for getting run feedback from vfd. check each and every thing again communication protocol does not match each other. i want to control a servo motor delta with hand and i read the position in my ispsoft program and i can save this trajectoire points and repeat them automatucally, i use a servo drive asd-a2-M and a dvp12SE11t plc. i don’t understand the capture function. I Have a delta SA2 PLC and DOP-B 411 HMI . suddenly come a warning at HMI ‘Device Not Support’ What is the Problem? I need a technical support for DELTA PLC model DVP10SX. I need to solve mathemaical equation to calculate power of number. Can you please suggest Ladder diagram program for this. i have DVP-12SC CPU i have alarm battery low and error on CPU. i have changed battery but error still on cpu and not communicate to HMI . It is in pulse mode? How much pulses u have set for one revolution in drive? Check wiring of pulse and direction…. I would like to log 5 individual data from field input devices such as 3 DI,2 AI and record the same into any usb device. How can I choose the modules and can I do it independently or automation engineer will require. I want to communicate my Delta PLC DVP-14SS2 with Panasonic servo motor Minas A6. I tried a lot but couldn’t the proper connection between this servo drive and PLC. I’m sending pulses and direction on Y0 and Y2 respectively. This programs get runs on Stepper motor. motor is running but servo is not working. Can any one please help.. Its urgent…. Communicaiton error alarm when connected PC with Delta PLC by RS-232 caple . Noted : Setup com port on PC is completed . This problem is with same of its version . try to update new one and problem solved. if you want simple logic program then just. now this x value should be put in hmi. so if both are same you will get bit on. and use this bit to interlock motor. Can you send me sample program. Please can you tell me the I/O connection between B2 series servo drive to sv28 plc. what is the procedure of offline simulation in wpl 2.45 software and how to solve time out error during offline simulation. I’m researcher, i build PID controller for PMDC motor working with 200ppr encoder ,i have problem with fluctuation of the speed,please any help? Did you try to use this Instruction?? 1.The received number of pulses of input devices assigned by S1 is calculated within the time assigned by S2 (unit: ms). The calculated result is stored in the register assigned by D.
2.This instruction is mainly used for obtaining a proportional value of rotation speed. The result D and rotation speed will be in proportion. The following equation is for obtaining the rotation speed of motor. can anyone provide me the sample program of servo drives to run servo motor alternatively and also to homing the servos. and my completion flag for Y0 output is M1029. But when adding this Memory flag of M1029 as an input of next Motor Pulse, i could not run the output of Y1, this M1029 shows ch1(Y0 and Y!) is completed. I need help in this please..
when ever i simulate the program it show the time out error. i run this program offline and it automatically come out from the simulate mode and show time out error. THE SERIAL COM PORT OF MY PLC IS NOT WORKING..PLEASE HELP ME..
Hi all. I have a faulty sequence Controller DVP14EC00R2 which has stopped working and is not transmitting power. If i purchase a new one is it pre programmed or do i have to get the person who installed the first one to program the replacement one? I have DVP-12SA2 PLC & DTB4848 PID Controller. I want to communicate both on rs485 MODBUS RTU communication through com2 of PLC. So please give me solution, also any sample program & required setting in PID Controller. ya required setting in pid .. check pid protocol setting like station address and parity and mode etc etc..
and modbus intruction in plc for communication. I will give u the sample program and explanation don’t worry. I am prasad ,we are using the PLC is dvp80EH002T this PLC is Woking very recently got a one problem thet is low battery and communication error. Please give me the session & support. if battery run out there is no option of it. build a new program.. all the best of it. It is control function in PLC unit mail me on asimlambay@gmail.com .. mail me what exactly you need. Hello, I´m using a DVP-12SA2 with an extension modulo DVP-16SP, the ins i´m using is X10,X11 and X12, the indicative LEDs for each of then are turning on, but on the ISPsoft program it doesn´t recognize this ins, do I have to configure this extension module or something? how I can do it. if I give 24V Pulse then Counting. but by 5V pulse not counting. any one can help me how can I do it? Sir… I am mani… I am using dvp series plc… How to connect bluetooth module…. Hi everybody. i need a help. i have PLC DVP 12SC and i need to change de battery . i see the manual and i need to change it for max 3 minute or less . This is true ? if i can do it the programm inside do not erase ? i need to be sure please. I am using dvp14ss2 plc and extenssion module dvp16sp but i am enable to communicate extenssion module. How to add a extenssion module? It need any special reauirments? is it possible to programm a dvp plc in c or similar? I am using Delta PLC series SA2 and software ISPSoft.I have a requirement of Load-cell Calculated dispensing fluid. Can i close the Channel when my dispensing volume reach to desired value which is set by user. Exactly what i am trying to explain in the case of stepper motor we are using pulse and direction.When pulse reached to set value channel stop to throwing pulse like that can i achieve in case of analog signal. can any one tell me how much input / output module can be connected with SS2 /SA2. I need to connect 6 modules 16SP, 3 modules 04AD and 2 modules 04DA. can any one tell me what is the solution? I want to communication one PC end utility with DVP-SA2 through serial communication. I am not able to write a routine for CRC calculation? hello i have question about wpl soft for delta plc .how can i give the subroutine in wpl soft .i have wrote main programme after that i have wrote the FEND instruction then i have wrote the subroutine .in main programme i have called the subroutine but how do i start the subroutine because i wrote regular logic for subroutine before end i wrote SRET but in simulation subroutine doesnt call. please give me suggestion how i write the subroutine? 1- how to connect my PLC unit to my android app or to make an interface between them ? 2- how to send and receive data by PLC to web service ? 3- how to physically connect my PLC unit to the internet (hardware) ? I am using DVP-14SS2 with DOP-B07 HMI for a machine automation. In machine running condition some times it stops for a moment and indicates communication error 3 message on HMI. It starts working after 1 sec. automatically. This happens typically 3-4 times in a hour. I have changed communication cable but it problem not solved. I am having doubt that PLC might be stopping in running condition. With same series PLC and same program other so many same machines are working fine from 6-7 years. make ensure to take a look into communication cable. Greetings! I am a student, I have DVP14SS2 PLC and I want to connect it with matlab can please someone tell me how can I connect it?I want to live interface it,how can I do this?Thanks! In WPL soft, Menu-Comunication-Format PLC memory, Remember that you lost the Charged program, and if you have a Back up you dont should be problem. how to latch timers in dvp20es2 plc when power fails and the timers resumes from where they stopped when power comes ? u should take retentive and accumulative timer…if power failure means its get latched,after power coming,again its starts from where it stops. please tell me that what is the first input address of DVP_8SM that is connected to plc DVP_14SS2 ? you cant crack it. ha but you have to format the plc using WPL soft . How r you? I purchase a new plc dvp14es v6.8. When I write to plc (v6.8) a ladder program with WPL Software (2.37). The program is not run and inverter is not showing any frequency parameter. But our old plc v5.8 is same ladder program is run with inverter and all parameter is showing. Dear Please , can you send to me the aplications that are working good and bad. DO WE HAVE PNP TRANSISTOR OUTPUT IN EH2 SERIES PLC? I have to connect the PLC Delta DVP-SE to Modbus TCP Festo Terminal. i think there is loose connection in power supply or power fluctuation. make ensure your power supply is good or bad. Is it possible to communicate delta PLC with FTview Scada in serial protocol . If yes please suggest how to proceed . Delta plc DVP-60ES Programming Password Will. I have a problem in the plc type DVB SS 14 A. Is there a way I can find out which bugs. Knowing I’ve experimented cable on other devices, and it works well. Can we reproduce your article at our website giving credit to your site? I want to send a command for example consider FBID023 (any think) to my laser using RS232 from my PLC. Will you please help me regarding it? Please provide some instruction with example. Please provide some program example regarding the motion of Servo motors in both Forward and reverse direction. I need a help for scalling load controller. I have used PLC with 20EX2 Delta PLC . But I need to scale that PLC. did you check the value of m1035? Hi all, I want to ask the question about a problem of communication between a PLC DVP 12SE and network analyzer CIRCUTOR, this equipment has output RS 485 and MODBUS RTU protocol. I connected the output COM 2 (RS485) directly to the analyzer (the cable length is 3 meters away, and did not connect a terminal resistance). The communication parameters of the PLC are as follows. I have been tested by changing the values of D1121 and D1120 and also the network analyzer, but I have not had a result. I bought DVP 06XA recently, but I don’t find this model at the Auxiliary Modules. I only found DVP 06XAH-2 & DVP 06XAH-3. Can you teach me how to add the model into it ? Can the Ethernet port on DVP SE be used to collect raw tcp packets. I have a machine that will produce a text string via ethernet socket connection, very much like a serial connection would from say a bar code reader. I would like to record this string and resend it via modbus/tcp. I can see no where in the DVPSE or DVPEN manuals or DCI soft that references a connect(client) or listen(server) stage or status. I have a DVP-14SS2 plc and would like to know how to communicate delta plc with any scada software. Also is delta plc compatible with all scada softwares ? please name the list of scada softwares through which a delta plc can be connected. Sir can please you tell me what is the “off delay time” instruction in WPLSoft and ISPSoft. They can help me to write a word to a M340 PLC HMI from Delta? I want know about LDP and LDF. I want to make DVP28SV11T2 PLC as a MODBUS master to communicate with Slave. Is it Possible ? If yes then how can i implement it in program ? I am struckle to get the coms running between my plc and coputer running on windows 7 pro Any suggestions the program COMMGR. does not start up. Do I have to run on windows xp only? Now I tried to set outputs 7 and 8 (Y6 and Y7) in reality in a short program, but the LED’s corresponding to this outputs on the extension module don,t lit, I can’t access the extensions outputs.What I’m doing wrong? Please help me. Good day. I attached an expansion module DVP08SP11R to a DVP20SX211R unit, because I need 10 outputs, but the ISPSoft gave me an error mesage [ Device input error ] when I want to set output Y8 and Y9. How can I have access to the last 2 outputs? Y8 and y9 do not exist. Bloody hell, you actually replied to a customer!!!!!? Haha, don’t get used to. My daily job is answering that questions, but trough other channels (mail, skype, phone etc,…). How We Communicate Delta PLC (DVP) to Shinko Controller ( RS-485/ RS-232) Please send Manual and Example. Good Day I would like to know if i can connect a load cell to a DVP 20 EX 2 plc? can i connect two vfds and a hmi with one plc RS485 port?? no no bro.rs 485 is 1:n connection.thats is one master and ‘n’ no.of slave.at a time one slave is able to communicate with master. I have a question about a Delta PLC. When there is a programmed error in PLc, its possible to get an email about the error? There are some PLC with Protocol DNP3.0? o how can conect a this protocol using swich ethernet? 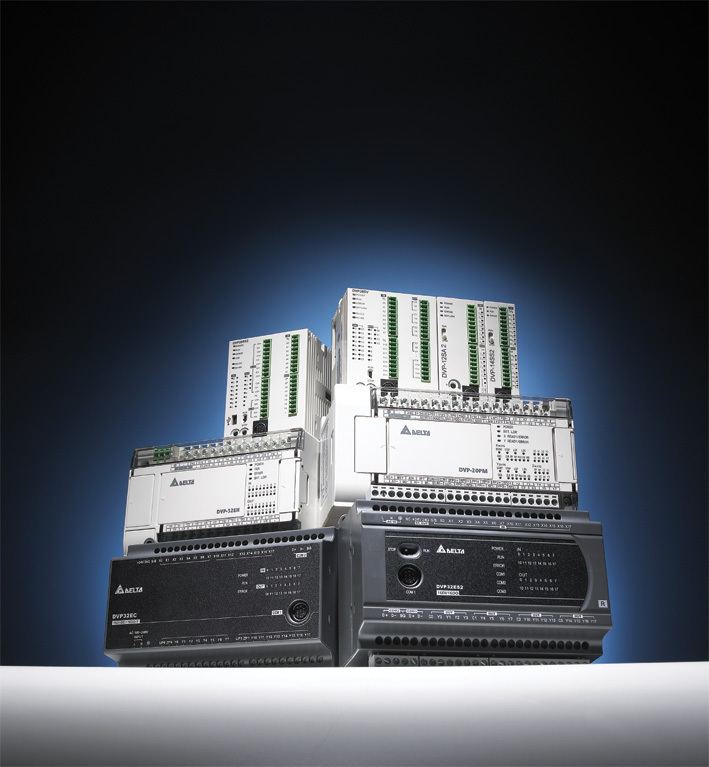 Where I can get comuncación RS48 and modules for Profibus Master AH500 PLC. Moreover Delta PLC has another module profibus master. i have a new machine that use a DVP-12SC model. Now the plc showing an error with no triggering from any inputs. I want to check it up the ladder diagram, i already install the WPLsoft and using the USB-SC09 jiacheng cable but still cannot detect the plc. can any one help me where i miss something here please . Dear Sir, I want use ETHRW command connect to modbus tcp/ip on pc (pc as slave) and PLC as master. What kind of Delta PLC is possible. Does ETHRW command support for DVP-SE211R ? Could you please post a link which shows a simple ladder diagram to connect and send data via RS485 or RS232, to a serial RX microcontroller. I would like you to help me with my issue, I have about 50 modbus rtu sensors connected together with a daisy chain topology, and I would like to read the registers continuously and store the values of each register in delta plc memory and for this purpose I have selected DVP ES2 which has two communication interface, through COM3 I would like to collect data from modbus sensors on the rs485 bus and through COM2 I would like to read data from PLC memory to my SCADA software which supports MODBUS RTU driver over serial connection. Can any1 post a solution of this. Any ideas on how I can fix this? I have physically moved the program block containing the line referenced but that does not do anything. I’ve Delta DVP 20EXPLC. In this PLC, we can generate the pulsed outputs at Y0 and Y1. I wish to do the single phase inverter with the help of this pulses. Now, I am using four MOSFET which are going to operate the switches for inverting operations. Basic inverting operation is at that time pair of MOSFETs only should be on, remains or OFF. The problem for me is, When I’m giving the pulses from the PLC, the pulses of 4 MOSFETs are same, It cant operate with the above format. So, I didn’t get inverted sine wave signal. I hope that You can understand my status. If it is not sufficient, I am ready to explain deeply according to the reply. Please help me with out this problem. Dear sir, please me with one example conection dvp01pu-s with one encoder open collector NPN?. Dear sir, please tell me how to communicate and call data from load cell module to sx series plc. load cell module shows weight in lcsoft software. but i want to use the data in plc program. Dear Sir, Please give me programming manual DVP-SS. How is the efficiency of Delta PLC & Drives in HVAC? Any references? i have controller 5 axis for process of cokies 5 servodrive 2hp what plc support ? Hi every body! I have a problem with the PLC model ES2. I try to generate a random number but the program does nothing. can you tell me what is wrong? i´m using RAND. can i connect this device to my (Dvp 14-ss) via rs-485 to import all energy details of my house in plc . I believe its a tough question to enquire about the product ? Please suggest me a PLC to control 3 ServoDrives for position and direction which takes pulse input. For 3 axis, the best should be DVP28SV, due all the others have 2 axis limitation. How many servo drives can this plc control ? Minimum 3 or maximum 3 ? Also can this plc read the pulses of encoder of the motor to manipulate the output in the ladder diagram ? I want to useLS XGB series plc to communicate to delta vfd-B in modbus , pls sending a sample program for these. I´m afraid we´re located in Europe, and India is a different region in control for other colleagues. Configure the PLC for communication parameters, match with configuratin for the Display(you can use the wizard in WPLsoft.). with what model of PLC do you want to connect the HMI, selesct the same protocol of comunication between PLC to HMI. This blog is for whole world, because of that we request to ask in English.